"I Love You, California", written by Francis Beatty Silverwood in 1913, is the official state song of California. 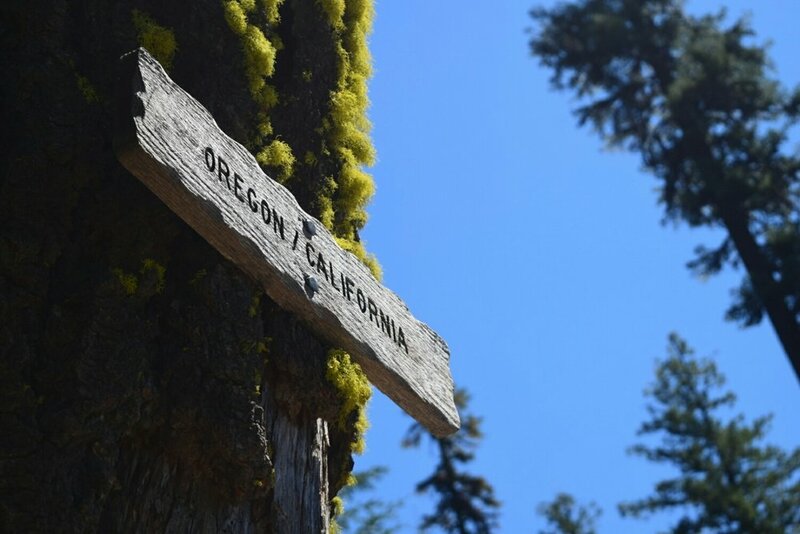 Atleast a week ago I crossed the California/Oregon state line, mile 1,689. That's 1,689 miles of California behind me. Spanning the months of April through August, my walk across California's deserts, mountains, and meadows has been unforgettable. Mt. Whitney was the literal high point in California (and the lower 48), 14,505 feet. Seiad Valley was the literal low, somewhere around 1,375 feet. The temperature extremes I knowingly encountered in California reached 25 F for the low (Mt. Baden-Powell), 106 F for the high (Seiad Valley). I walked ontop of packed now in all months except August. And really in the beginning I fully regretted not going 10 degrees lower on my 20 F sleeping quilt (cold weather doesn't initially come to mind when most Americans think California). We'll see if that comes back around to bite me again as I move further north towards that Canadian border. As for that border, the trajectory I'm on will place me there somewhere within the first week of October. For the record I'm hustling. I'll finish with more 26 mile days than I will remember to count. Speaking of marathons, those that read my McFlurry post after my first 26.2 mile day will get a kick out of this coincidence: I got word recently from other hikers that the McDonald's in Cajon Pass burned to the ground! That was THE McDonald's where I purchased the celebratory McFlurry... It no longer exists. As much as the scenery of the trail has been a delight so far, the people I've encountered while walking have been every bit as unforgettable. Sure enough the trend I noticed in the beginning, "someone old, someone new" each day, continues. Though the occurrences are no longer daily as the number of thruhikers still on trail have dwindled significantly. Many days I walk alone seeing almost no one except the occasional south bound hiker. But I will still say the demographics are 50-50 American citizen/non-American citizen. Speaking of people I've encountered, in passing a few days ago, nearing sunset, a south bound hiker (headed for Mexico) called out my Ohio University t-shirt. Turns out we both graduated in 2012. Life took him out west after graduation, most recently Salt Lake City. I stayed in Ohio. And here we are these four years later to cross paths for the first time. (So shout out to Ben Clemens for those of you that read this and may know him from OU). My mind's all over the place tonight. I'm currently camped just below the rim of Crater Lake, PCT Mile 1,820ish. I'm carrying a gigantic load of food to get me 180 trail miles in between resupply points (next stop Sisters or Bend). I paid for the wifi at the Crater Lake Lodge just to make this post because it's been over a week since my last post. I'm currently working my way through the more remote parts of Oregon but still look for posts every couple days and I will keep providing a glimpse into the lesser seen parts of the U.S.A.
Also bear with me (bare with me? ), there's no bear with me. The volume of posts has dropped off dramatically lately. This is a temporary lull in content. On my bike trip I was able to churn out daily posts as I had better access to electricity and cell service. But the added complication cutting into the posts lately is what I'm planning for next. The preparation is very much behind the scenes right now but in October I'll bring everything to light. And I will say that this next adventure to start this fall will be a blog worthy challenge!